Michelia yunnanensis is still the name most often used by the nurseries but the taxonomists have grouped all of the genera of the Magnolia family into the Magnolia genus and renamed Michelia yunnanensi to Magnolia dianica. In any case Michelia yunnanensis is a large shrub or small tree from Southern China, slowly growing to 6-12 feet tall and wide. The dense dark green foliage can readily be trimmed to keep Michelia yunnanensis as a hedge or even to trim it as a topiary. 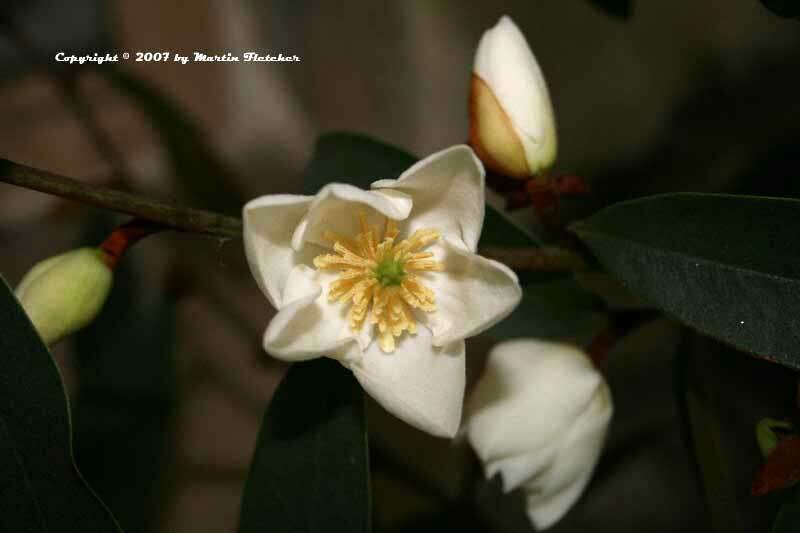 Michelia yunnanensis blooms in the late Winter and into the Early Spring. The 1.5 inch white flowers are striking against the dark green foliage. The soft pleasant scent is alluring, not overpowering as can be the case with some of the Banana Bushes. Cinnamon hairs cover the sepals and new foliage giving the plant interest throughout the year. Michelia yunnanensis is slow growing and is an easily controlled long term container plant. Plants are hardy at least into the high 20°'s and probably into the high teens as plants have survived in the Seattle area as well. Michelia yunnanensis should be grown in full sun or light shade and provided with a moderate water supply. White flowers of Michelia yunnanensis - Magnolia dianica. High resolution photos are part of our garden image collection.